West, Ian M. 2017. 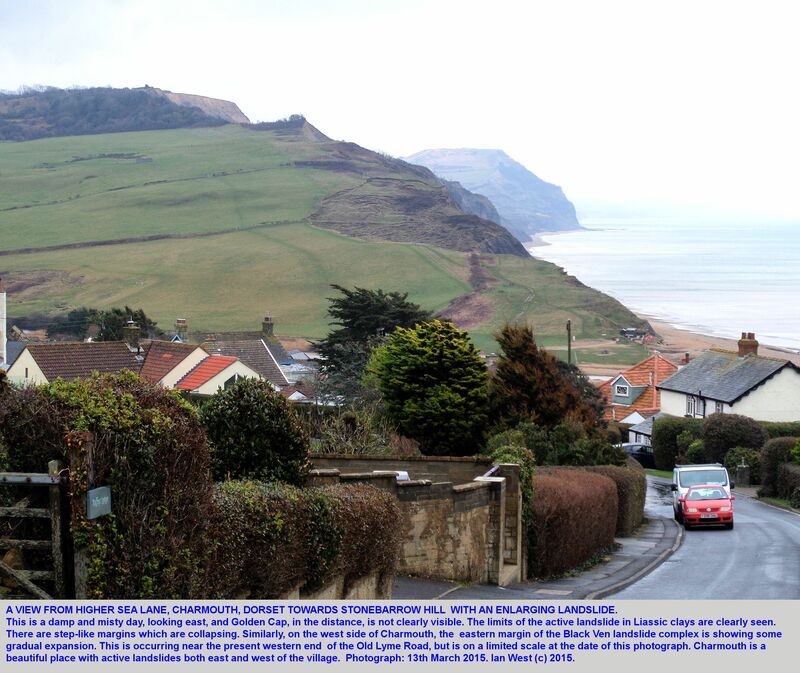 Charmouth - East to Stonebarrow Hill. 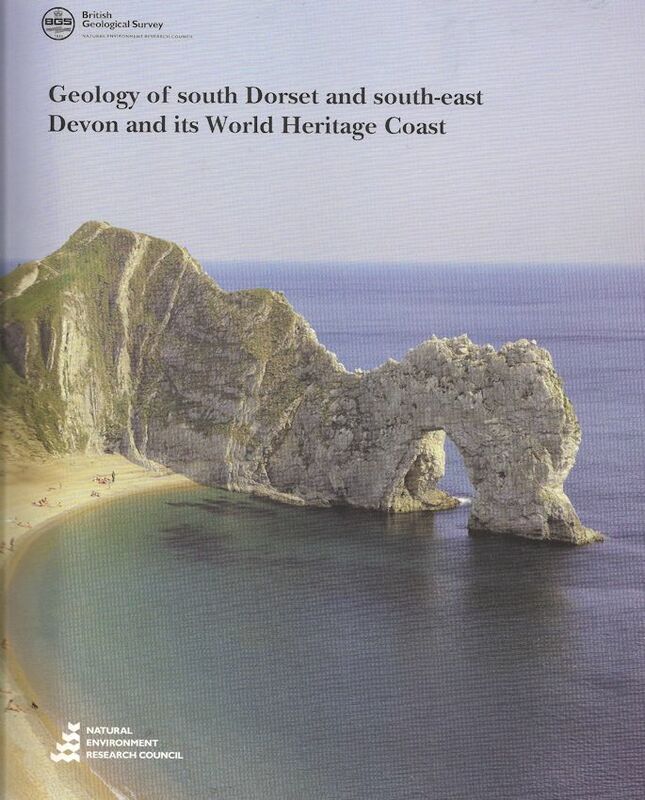 Geology of the Wessex Coast (Jurassic Coast - World Heritage Site). Internet field guide. http://www.southampton.ac.uk/~imw/Charmouth-East-Stonebarrow-Hill.htm. Version: 2nd June 2017. Website archived at the British Library. Go to Cliffs to the East or West? 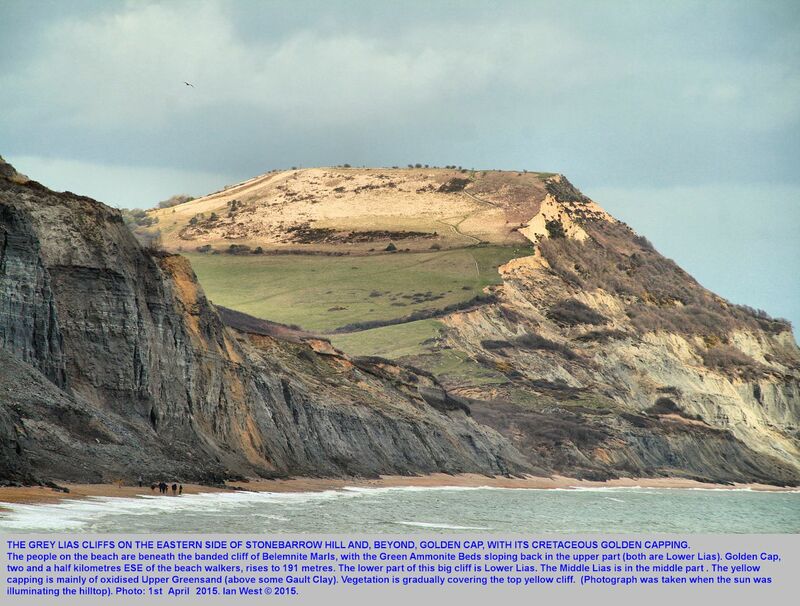 Golden Cap and Seaton ? 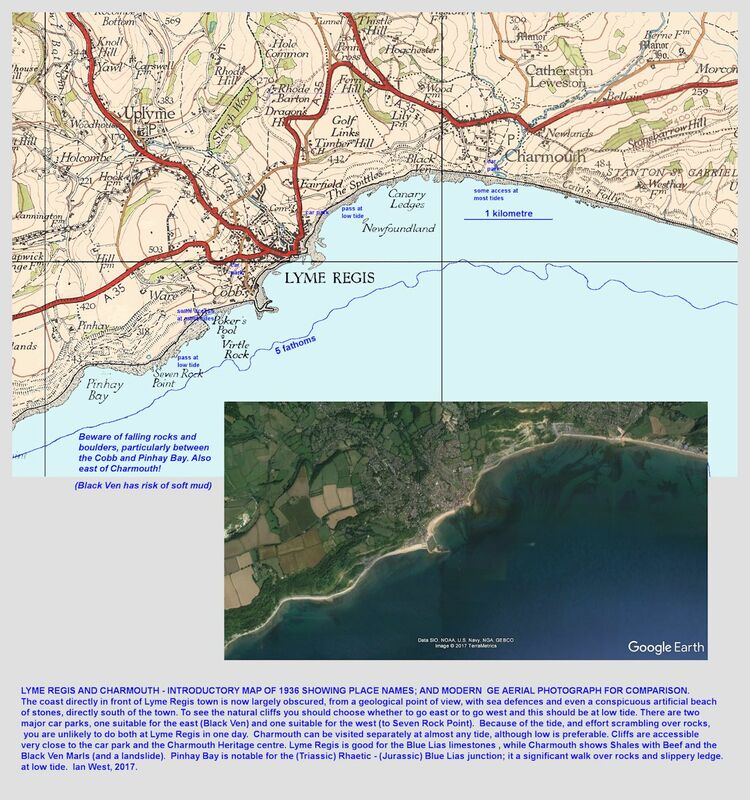 Black Ven and west of Charmouth to Lyme Regis ? 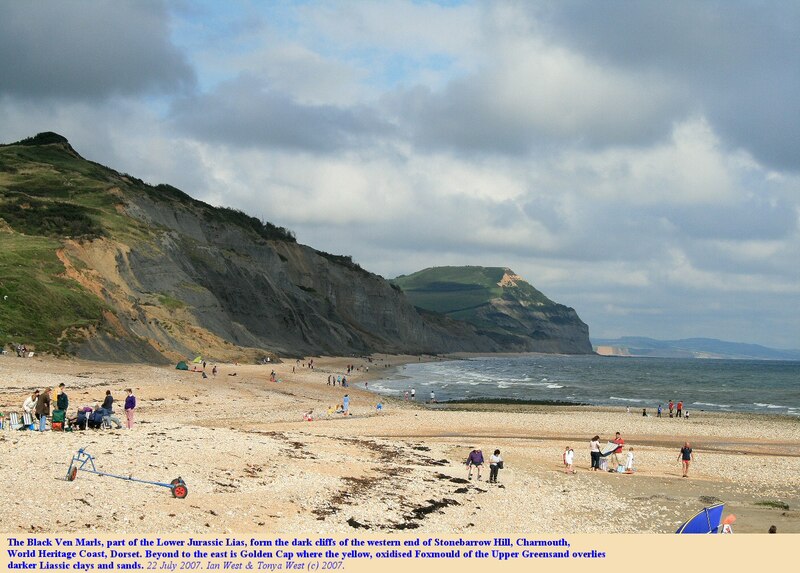 Safety on Field Trips to Charmouth and East to Stonebarrow Hill and beyond. This geological description is to provide information on localities which may be visited, but it is not a true field guide; it does not give a specific field programme and it does not advise the reader to go to any specific place. It is descriptive. If the reader chooses to go anywhere described here, they do so at their own risk and in accordance with their own safety procedures. Safety notes given here for any place are unlikely to be complete, in that there may be additional and unexpected risks. The main risk at the cliffs east of Charmouth is a sudden, catastrophic rock fall or collapse of the cliffs, to which this coast is prone. I have seen (many years ago) a nearby 100m. wide stretch of Belemnite Marls suddenly collapse without warning. This was in summer when the cliffs were drying out. The fall narrowly missed some geologists on the cliff. Stonebarrow and the adjacent area is notable for its landslides. In wet weather, especially in late winter and early spring, major falls and mudslides may take place on these cliffs. Debris can fall at any time though, and even in the summer drying out of the clays can lead to sudden, unexpected rock-falls of some violence. When studying these cliffs the foot of the cliffs should be watched, in addition, of course, to the state of the cliffs above. Particularly avoid the base of the cliff where there is any evidence of freshly fallen material, such as split rocks or signs of impact, and certainly do not linger there. Note that at high tide and stormy conditions persons may have to travel dangerously close to the cliffs. At low tide in quiet weather it is easy to move away from the cliffs on this stretch of coast. Even a small piece of marl descending at high velocity is extremely dangerous. Field parties should wear hard hats. At the top of Stonebarrow the cliff edge of chert gravel is dangerous and undercut by landslides. It must not be approached closely. The footpath from the summit to Charmouth has been diverted because of a major landslide, which took place in 2001. 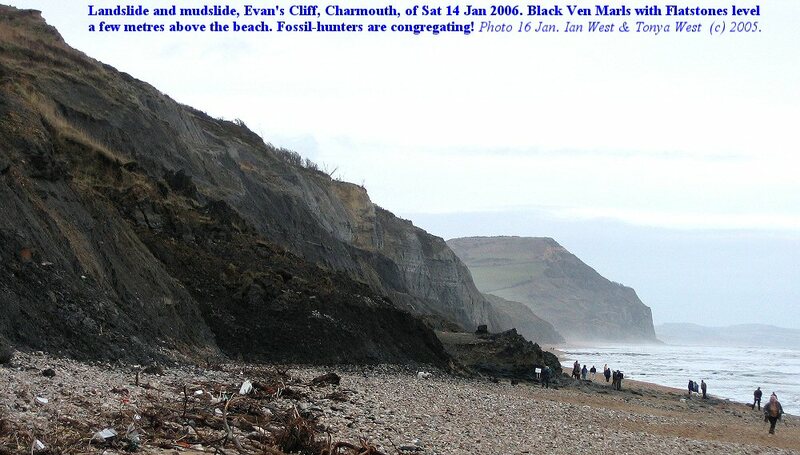 Mudslides can occur on various parts of the cliffs of Stonebarrow and the adjacent area and the soft mud can trap the unwary (see details below regarding landslide at Evan's Cliff in January 2006). Other risks include falling from a cliff. This ought not to be a particularly high risk here because the cliffs are not vertical and there is no good reason to approach the edge. Obviously, it is possible though to get too close to a crumbly and undercut cliff top so care should be taken. Even in ordinary walking, it is certainly possible to slip on rocks at various places. For example, the beach of boulders just west of the Charmouth Heritage Centre and car park is not easy to walk over at mid to high tide. The reason is that the boulders are curved nodules without flat tops, and between them are very irregular nodules of chert. Every foot position has to be at a different angle, and some smaller blocks may move. A treking pole is really needed here to give a third point of contact. Falling backwards is common on rocky and/or slippery beaches and a rucksack on one's back may reduce risk of back injury. Adders (snakes) might be present on parts of the cliffs in summer, but normally present only a very small risk. Hammering could be dangerous to eyes if protective goggles are not worn. Chert (or flint) nodules must never be hammered. Rising tides and also storm-wave action can cause risks, especially in bad weather conditions. 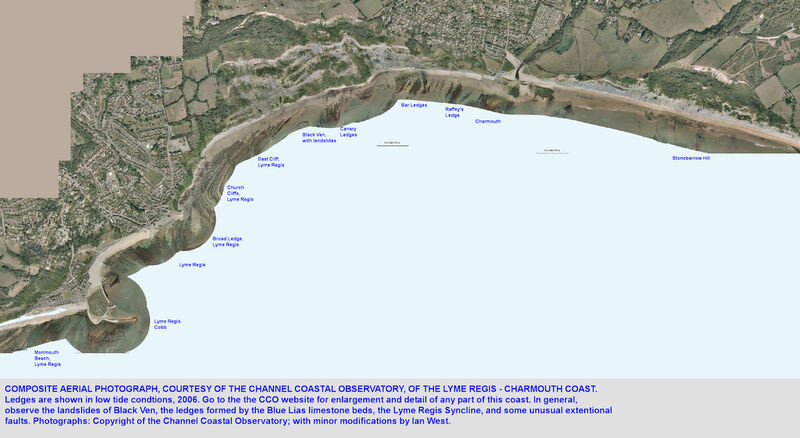 For aerial photographs of the Charmouth area go to: The Channel Coastal Observatory , National Oceanography Centre, Southampton. There are numerous, orth-rectified aerial photographs taken at low tide on various occasions. They cover all the south coast of England and elsewhere. They are of very high resolution. In addition there is much technical data, such as Lidar, available. First go to the online site above, then register with the CCO online and receive an id and a password. Subsequently you can download the aerial photographs and other coastal data that you may need. Note that the photographs initially are in ECW format and need an appropriate viewer, which can convert them to jpg should that be necessary. Examples shown on this website have already been converted to jpg. The general geologist may only need some of the aerial photographs, such as those shown here; coastal and geomorphological specialists can obtain much more technical data for research studies. Obviously excellent photographs are also available on Google Earth. 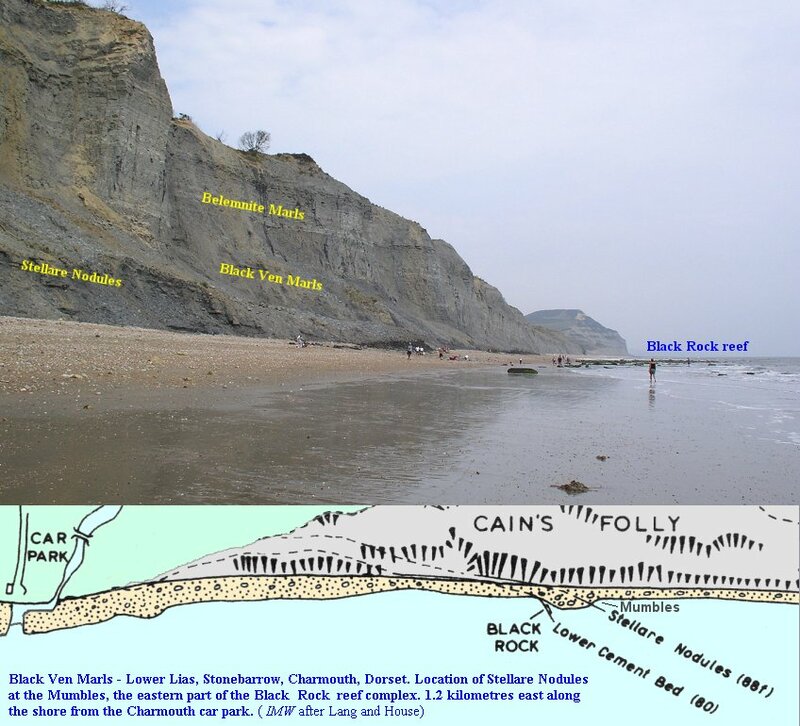 The Black Ven Marls are of great interest palaeontologically and sedimentologically. When first encountered they do not seem easy to deal with. They are mass of black clays and shales with some stone bands. It is necessary to find at least one recognisable stone or nodule band to fix a location in the sequence. I have intentionally provided three different vertical logs of the Black Ven Marls, modified after various authors. This is because there are some differences east and west of Charmouth and different authors have emphasised different aspects. The top diagram is the easiest to use. Note that the Lower Cementstone (bed 80) is described as "Black conchoidal marl, with several indurated bands" and not shown clearly as a stone band on the Lang and Spath (1926) log. This bed will be discussed further below. 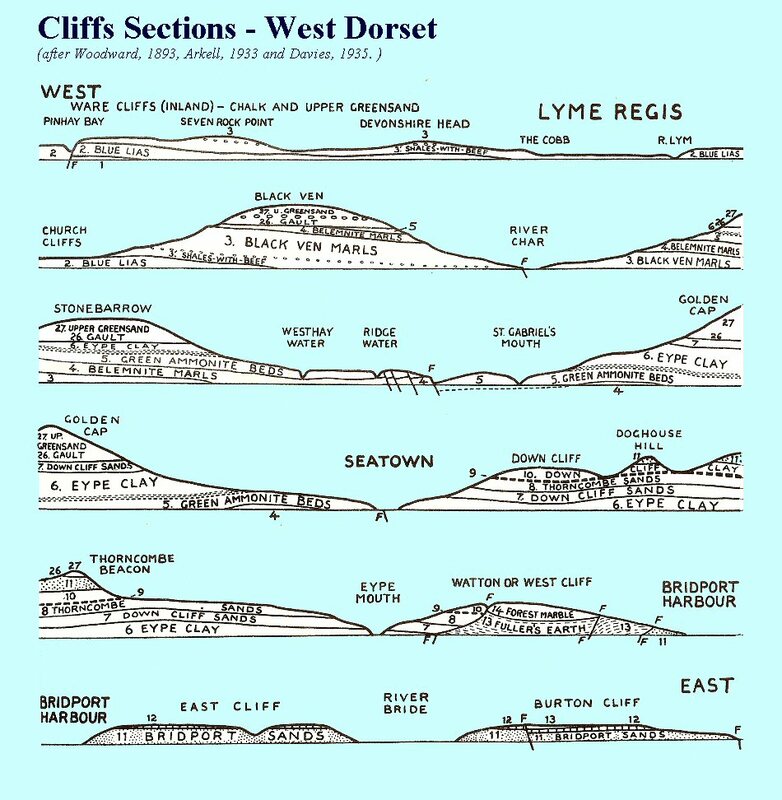 On a first visit to Stonebarrow it is probably easiest to use the top diagram, in conjunction with the horizontal cliff section. If you examining Stonebarrow Cliff first find the Lower Cementstone. This is easy because it is near the beach at Evan's Cliff, the first part of the section which you reach when walking eastward from the car park and the old cement mill (now the Heritage Centre). Find this bed and then proceed eastward. 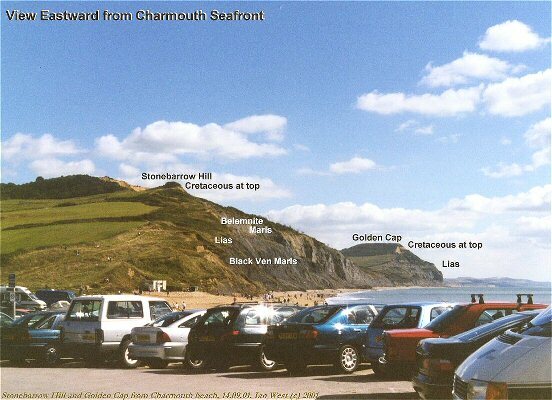 Although there is a local and gently anticline near Charmouth and there are some faults you will, in general, reach higher horizons as you travel eastward. 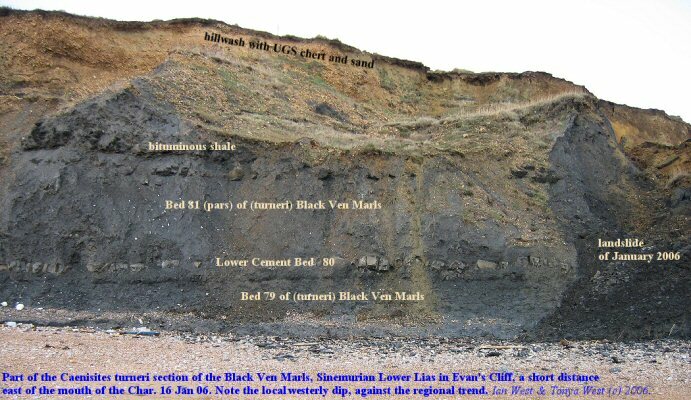 For those interested in more technical information, note that the key stratigraphical detail of the Black Ven Marls was given by Lang and Spath (1926). Dr. W.D. Lang was, of course, famous for his work on the Lias and wrote many papers on the subject. Lang and Spath (the ammonite specialist) gave the bed numbers and a faunal list of ammonites from most of these. It is a key work but not easy to use in terms of sedimentology since the lithological descriptions are not detailed. Wilson et al. 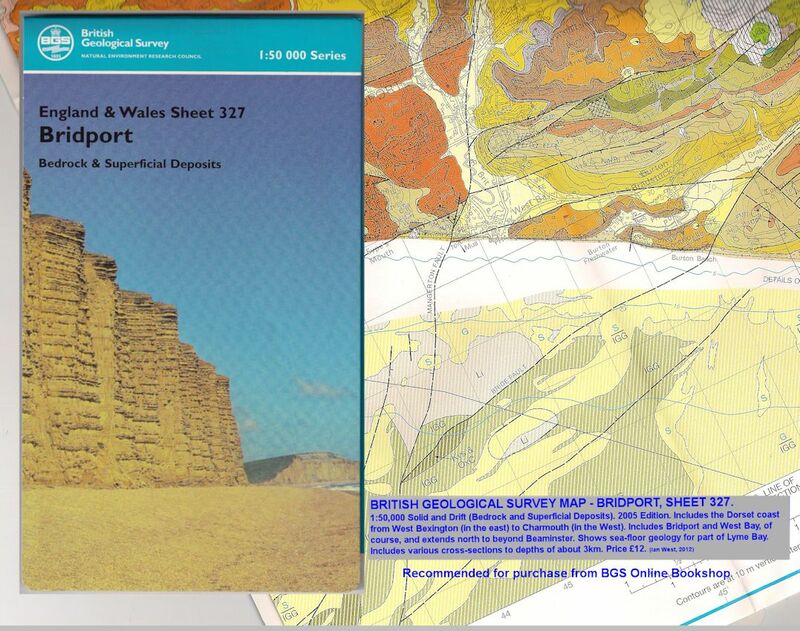 summarised Lang's work and they gave useful information on the lithology and outcrop. Their work is very useful and easy to read. The succession here has been briefly discussed subsequently by contributors in Torrens (1969) and in various other publications. For information on micropalaeontology of this sequence see Lord and Bown (1987). Ammonites are commonly found after storms beneath the cliffs of Stonebarrow Hill. Most of these are not of commercial value but are of much geological interest. Good, uncompressed and complete specimens of aesthetic value are rare because the area is subject to very heavy collecting, as it has been since Mary Anning's day, because various fossil sellers are very active in the vicinity. Picking up loose specimens is allowed without restriction, but few will be left around in summer. Excavation (digging) for specimens requires special permission because this is part of a UNESCO World Heritage Site. There is a code of conduct referred to on the notices here. 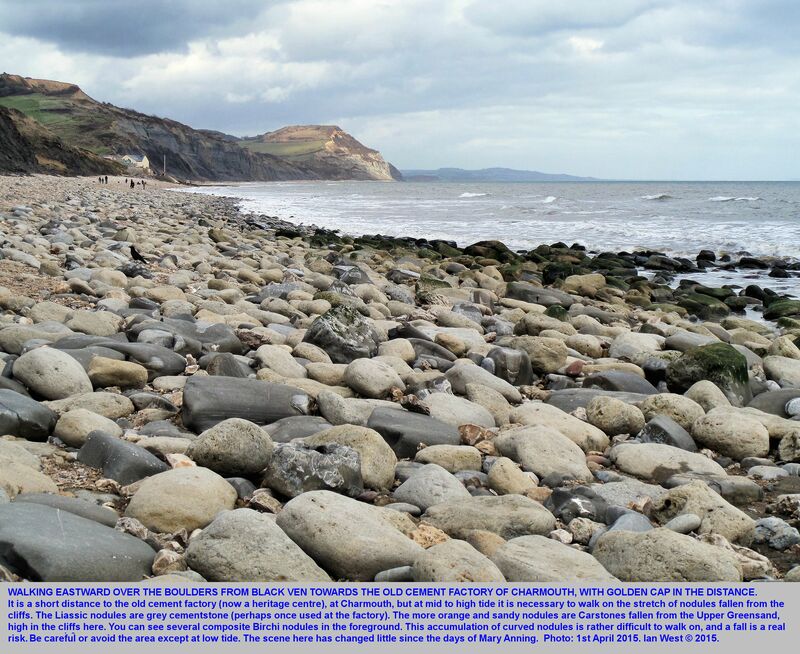 In the year 1858 James Harrison of Charmouth was quarrying the cliffs presumably for the manufacture of cement. 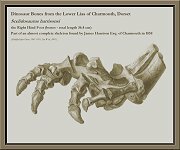 He found a few fragmentary fossils of limb-bones and sent them for examination to the famous Professor Richard Owen of the Natural History Museum (originally the British Museum (Natural History), London. Owen commented in 1861 that these came from the "upper member of the Lower Lias" at Charmouth. It is not clear in exactly which bed these were discovered.
" 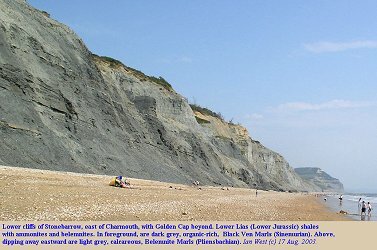 the continued attention paid by James Harrison, Esq., to the organic remains discovered during quarrying operations on the face of the cliff of Lower Lias at Charmouth, Dorsetshire, with liberal encouragement to the workmen, has procured for the original discoverer of the first indication of the Scelidosaur the materials for the present account of an almost complete skeleton of that extinct reptile. Following in the track opened out by the discovery of the skull described in the preceding Monograph, about twelve successive blocks of Lias were secured, with more or less evident indications of included bones, all of which, together with the skull, have been purchased for the British Museum. Subsequent complete exposure of the included organic remains has brought to light the entire vertebral column of the trunk and tail, to very near the termination of the latter..."
It is particularly interesting that sometime before 1959, as reported in Delair (1959), additional bones of an immature individual were found in a Flatstone Nodule (Black Ven Marls - obtusum Zone) by Black Ven, near Charmouth by J.F. Jackson, Esq. These remains are also in the Natural History Museum. 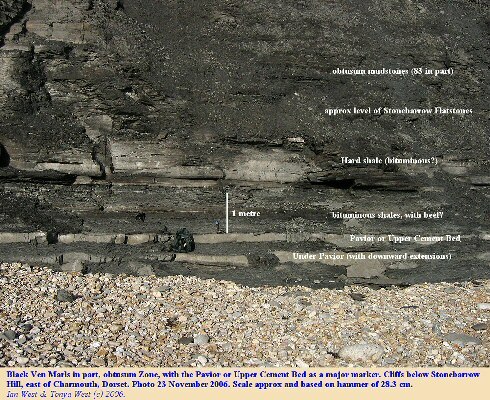 The position of the Stonebarrow Flatstones, referred to above with regard to insects, near the middle of the Black Ven Marls is well shown in a log of Hesselbo and Jenkyns (1995), Fig. 10, p. 117. They occur in Bed 83, the Obtusus Shales, which were described by Lang (1914) as a band of paper shales (i.e. 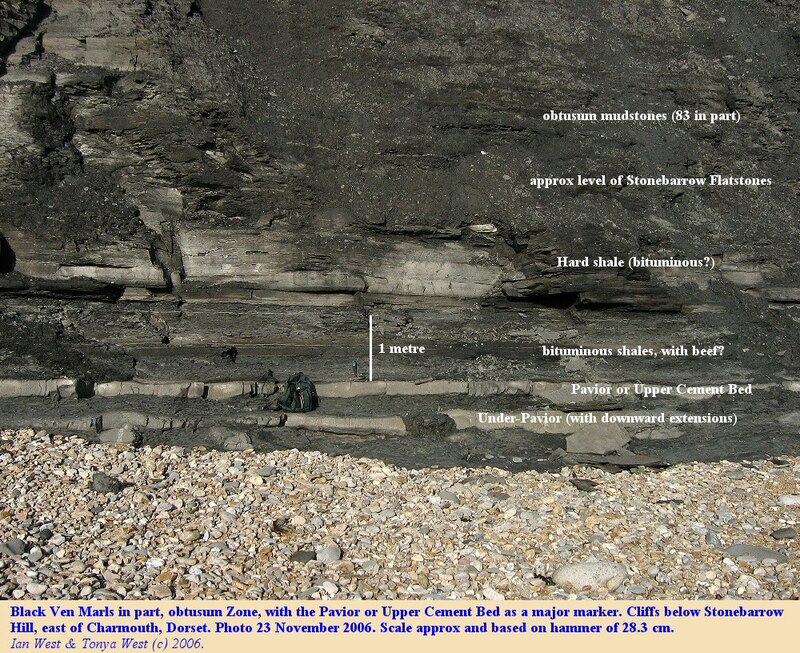 bituminous shales) about 2.4m (8 feet) thick that project from the general surface of the cliff and are a conspicuous feature, even where the cliff is grassed over, since at such places they often project through the grass and can be traced from section to section. 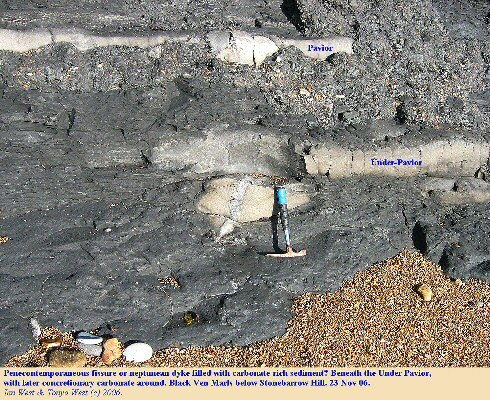 Lang referred to a layer of nodules which occurs in the shales where they reach the beach under Stonebarrow, and these are presumably the Stonebarrow Flatstones. Asteroceras obtusum is collected from these beds and Xipheroceras aff. dudressieri (d'Orbigny) has been found here. These shales run out to sea between Dover Ledge and the Mumbles Rocks (see the geological map in Lang, 1932) . Perhaps this is a place to look for more dinosaurs! These logs of parts of the Black Ven Marls are intended to help the understanding of just Scelidosaurus seems to occur only at one horizon. The left-hand graphic log is based, with modifications, on Lang and Spath (1926). 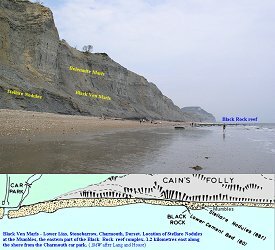 It gives the main units within the Black Ven Marls and shows the approximate position from which the dinosaur remains were found. There are two levels of Flatstones so the exact position is not fixed. All the beds are necessarily laterally continuous and there some differences between the section on Black Ven and at the foot of Stonebarrow. The nodule horizons are emphasised here to fix positions relatively easily. See Lang and Spath (1926) for details of the ammonite faunas within this. The right-hand diagram gives a different version of the Black Ven Marl succession. 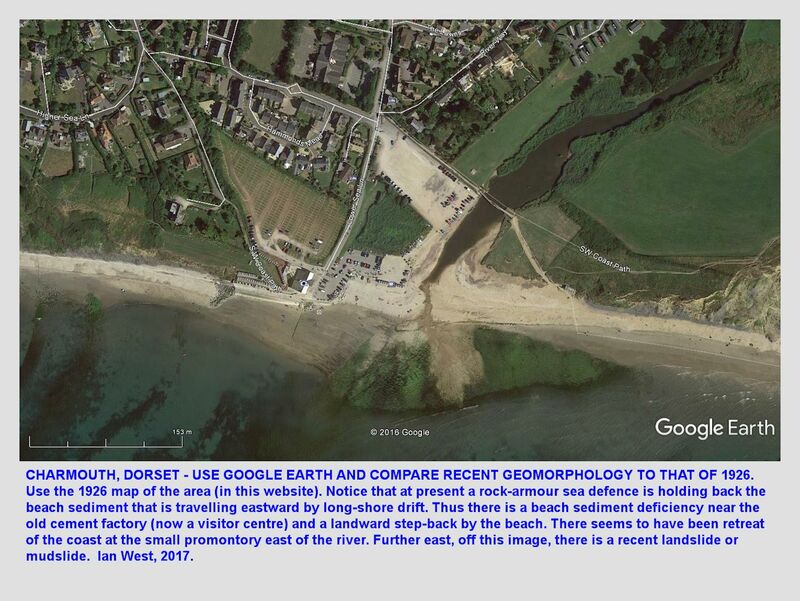 This is based on the work of Hesselbo and Jenkyns (1995) and provides ammonite zonal information and a metric scale. 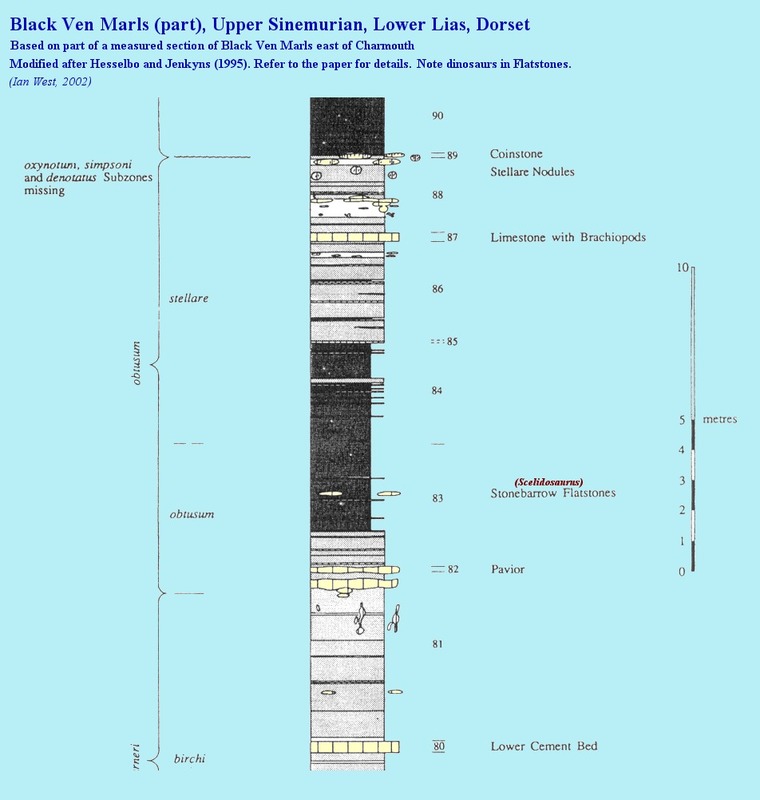 Hesselbo and Jenkyns' (1995) paper is a good modern survey of the stratigraphy, and is worth consulting. 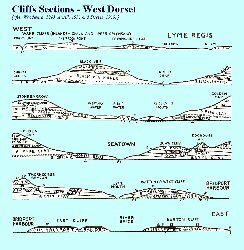 The occurrence of several dinosaur remains in the Lower Jurassic, Liassic sequence in Dorset at only one specific horizon is a mystery. 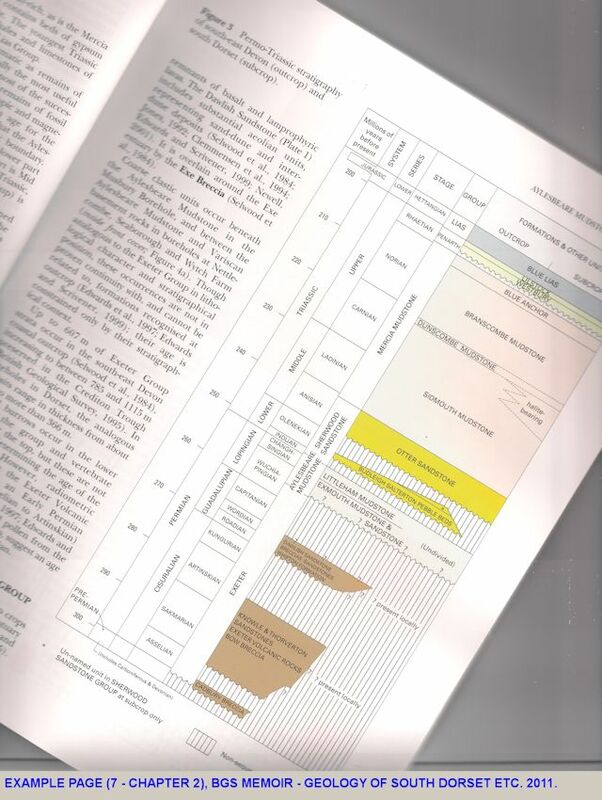 The Obtusum Zone in which it occurs is a specially interesting unit, though, and in the Mendip area is represented by the Obtusum Nodule Bed, which rests on various lower zones in different places and contains fossils derived from their denudation; it is, in fact, a remanie bed (Arkell, 1933). This shows that in places the Jurassic sea floor was land at this time, doubtless inhabited in suitable environments by Scelidosaurus . The level of the Jurassic sea-floor fluctuated with basins and swells developed and irregular phases on swells where the seafloor did not subside and shoals and exposed surfaces developed Sellwood and Jenkyns (1975). The Coinstone, some way above the Flatstones, is the result of such exposure on a swell. Subzones are missing here, although present in other places to the north, and a very low island or peninsula existed for perhaps a quarter of a million years. This was then submerged, perhaps quite rapidly. 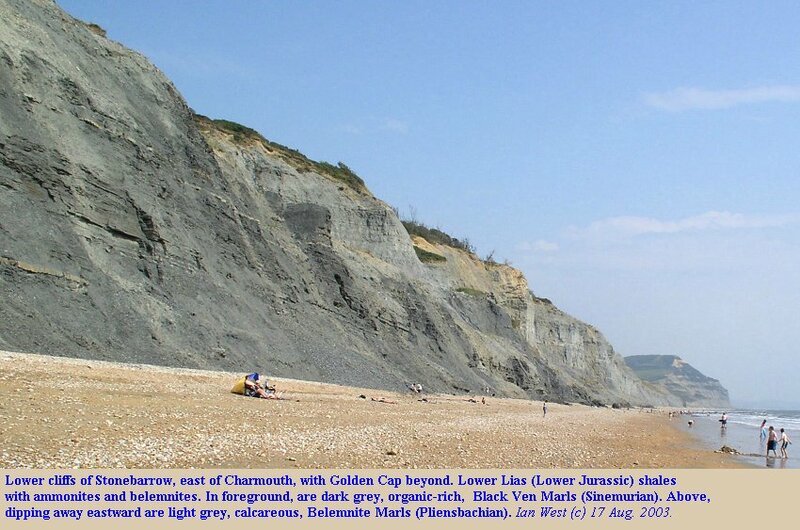 This is not the dinosaur horizon but it shows that there was a swell of some type at Charmouth, not too long in geological terms after the dinosaur deaths of the Flatstones lagerstatten (fossil bed). It is, therefore, quite feasible that the emergence and submergence of the Coinstone type, occurred near here in Flatstone times. 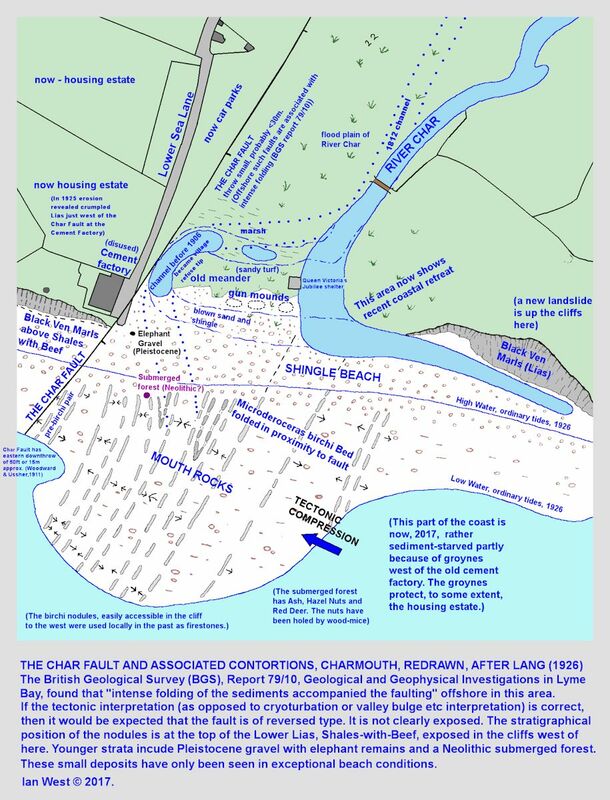 There is a mechanism of basement faults, and there is evidence (to be discussed later) of penecontemporaneous fault movement in the Lower Jurassic. The implication is clear. Low land with dinosaurs, trees and insects could have been flooded, either relatively rapidly but quietly or by a tsunami. The bed of concretionary carbonate a short distance beneath the Pavior is referred to here as the "Under Pavior". This is a new name, merely informal, and invented for convenience because there does not seem to be a quarryman's name for this bed. The cementstone shows rather irregular cementation by early diagenetic carbonate, and these downward extensions provide an easy feature for recognition. Beneath the bed there seem to be early fissures (perhaps to be regarded as neptunean dykes) filled with carbonate-rich sediment. These fissures have the morphology of tension gashes formed by a vertical sigma one (maximum principal stress). The Lower Cement Bed (Lang Bed No. 80) is easily found in the lower part of the cliffs just east of the mouth of the river Char, where it has a gentle westward dip. It can also be found on the west side of Charmouth at a higher topographic level. 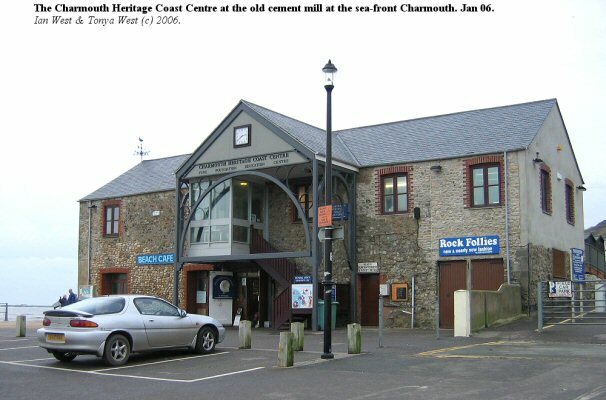 No doubt this was, in the past, a convenient economic resource for the nearby Cement Mill at Charmouth (now the Heritage Centre, shop and cafe). This interesting bed is an argillaceous carbonate that varies laterally to a considerable extent. Lang and Spath (1926) actually described as "Black conchoidal marl with several indurated bands" and list it as 1 foot thick (0.3m). 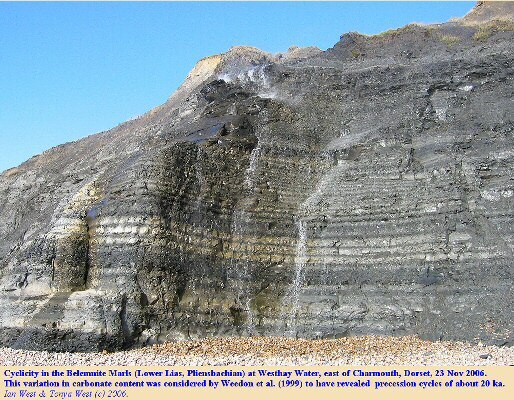 Although the indurated bands form a cementstone which is generally conspicuous, in places, particularly west of Charmouth, it is not well-developed. 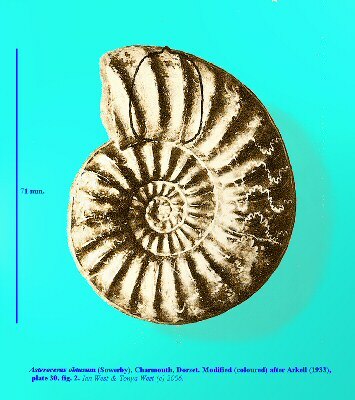 Lang and Spath (1926) noted that the ammonite fauna is Promicroceras cf. capricornoides (Quenstedt) with Promicroceras aff. pyritosum Spath. The Lower Cement Bed is largely dolomite (dolostone) but in places it is present as limestone, probably its original condition. Carbonate is about 88% with dolomite varying from 0 - 82%. The dolomite can be ferroan in places (Bellamy, 1980). The limestone facies, west of the river Char can be seen as a thickened lens with a shale parting. There are nodular burrow-casts present. Bellamy (1980) found possible submarine cement in sub-horizontal cavities within the upper part of the limestone. The dolomitisation is presumably the usual burial dolomitisation associated with the fermentation zone in organic rich clays (i.e. like the Kimmeridge Clay dolomites). Bed 80 has the special feature of preserving transitions. Sr2+ is 710 ppm in the limestone facies, and, as you would expect, about half that (320 ppm) in the dolomite replacement [because Sr substitutes for Ca and not for Mg and there is only about half Ca2+ in the dolomite]. 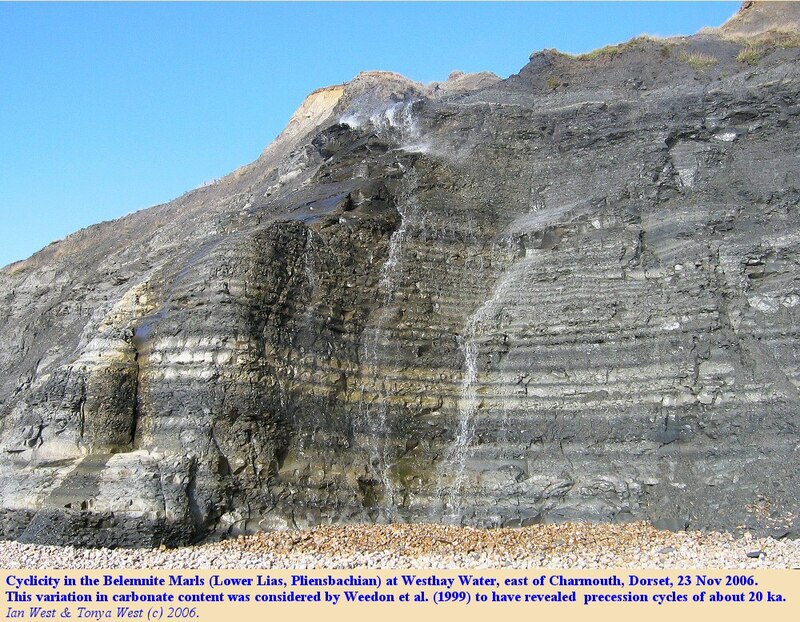 The figure of 710 is higher than would be expected for the porous Jurassic shelf limestones of Dorset but not unusual for a carbonate in clay [because aragonite, which has high Sr2+ would not have been lost early]. 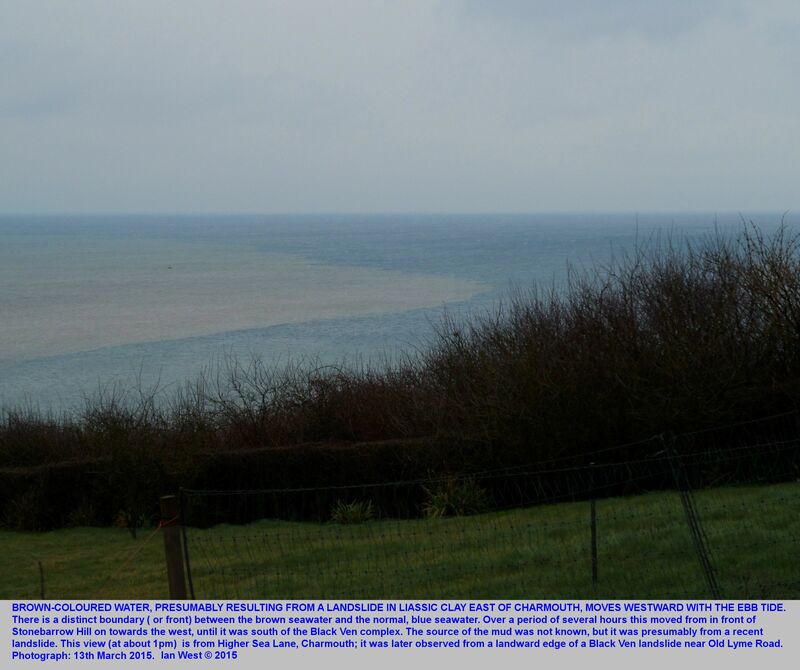 A front of brown muddy seawater, moving slowly westward with the ebbing tide was seen from Charmouth (Higher Sea Lane) on the 13th March 2015. This mud might have come from the landslide at Evans Cliff (western end of Stonebarrow Hill, or Cain's Folly). 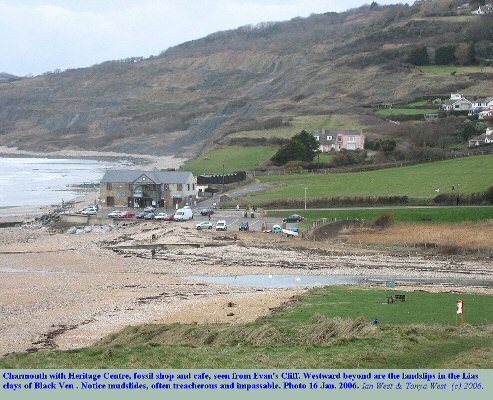 On Saturday 14 January, 2006 a clay landslide took place at Evan's Cliff, a short distance to the east of the Charmouth beach car park and stream. 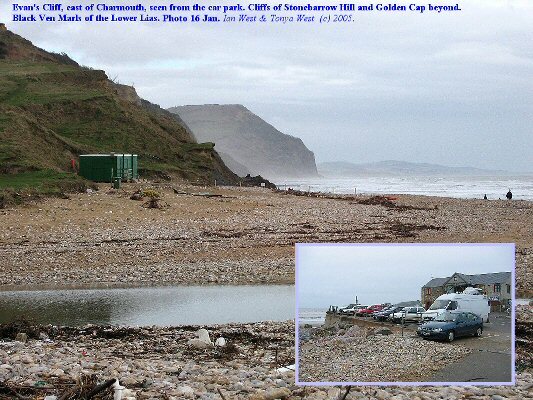 It occurred about an hour before high tide and as a result 16 people were unable to return to Charmouth. Some tried to cross the landslide and became stuck in the mud. The slump involved Black Ven Marls with cherty and sandy hillwash above. The hillwash is from the Cretaceous Upper Greensand higher on Stonebarrow Hill. Water had flowed through the hillwash and saturated the clay beneath. The foot of the cliff has been progressively eroding, therefore taking weight off the toe. 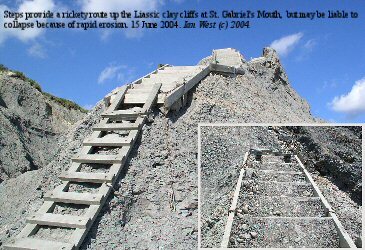 A rotational landslide developed, as shown above, with a steep slide-plane and visible backscarp. The slide-plane descends below beach level and probably curves out almost horizontally at somewhere near the base of the Black Ven Marls. 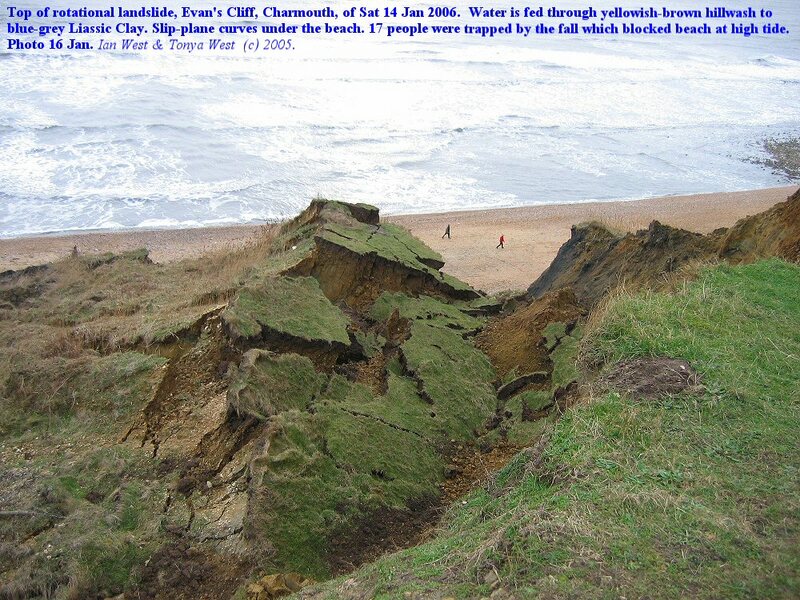 The beach in front was raised to some extent immediately after the landslide but this small uplift was soon eroded away by sea (personal communication from Richard Edmunds). 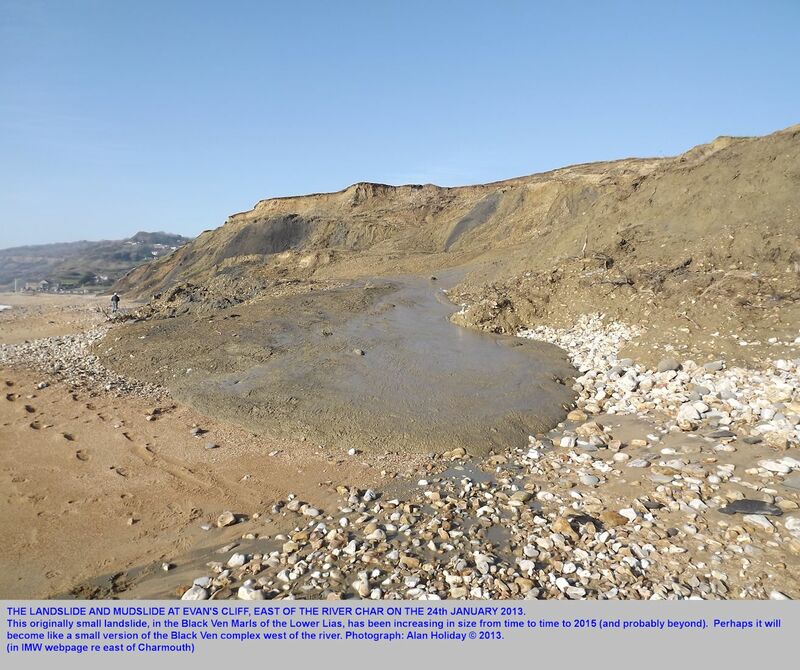 Associated with the small landslide were mudslides, kept soft and lubricated by the water supply from the porous and permeable yellowish hillwash above the clay. High tide was reaching the foot of the landslide and thus, unfortunately, encouraging some people to try to cross the mudslide. Warning notices have now been put up. 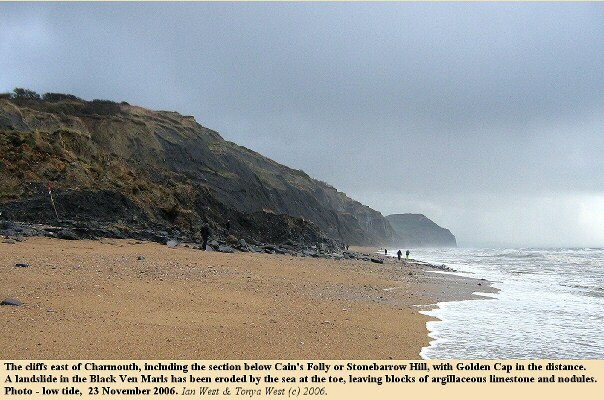 Richard Edmunds does not think that the landslide will remain for long as a small promontory on the beach, but will be cut back by the sea. 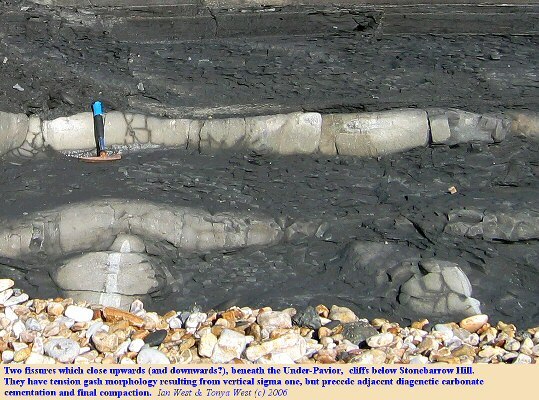 Stratigraphically the location is interesting because the cliff fall has taken place where the small oval "Flatstones" of the Black Ven Marls are present. At about this level there are interesting faunal peculiarities, including insects and the Charmouth dinosaur - Scelidosaurus harrisoni. 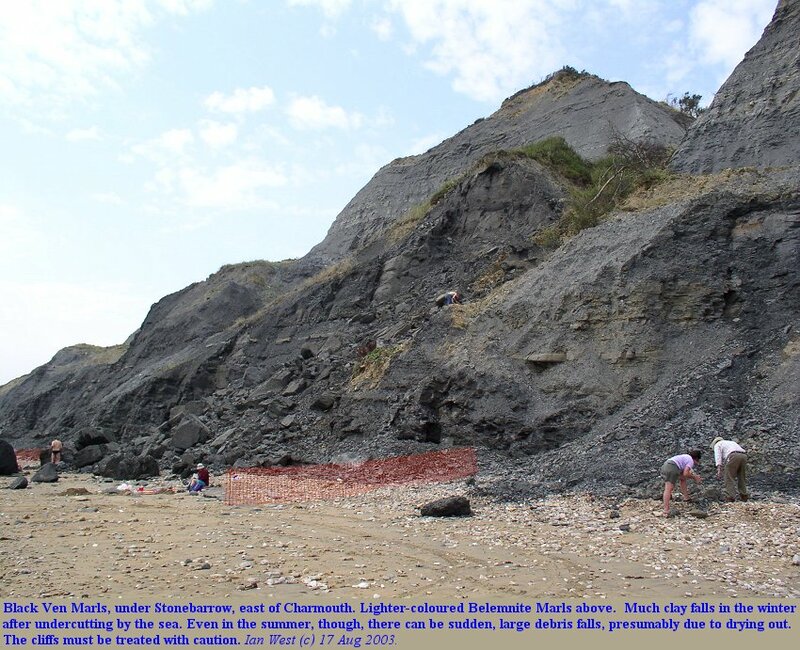 With its proximity to Charmouth, a centre for fossil collecting, the landslide area has already been thoroughly searched by the fossil collectors. No doubt, though, the hunt will continue! The Press have dealt with this cliff fall with some considerable enthusiasm. It is, however, of only small to medium size rather than exceptionally large, though. Here is an example of a press report (Dorset Echo for Monday, January 16 2006, p. 1, by Ben Glass). "Boys Rescued in Mud Drama: Coastguard heroes drag them free. 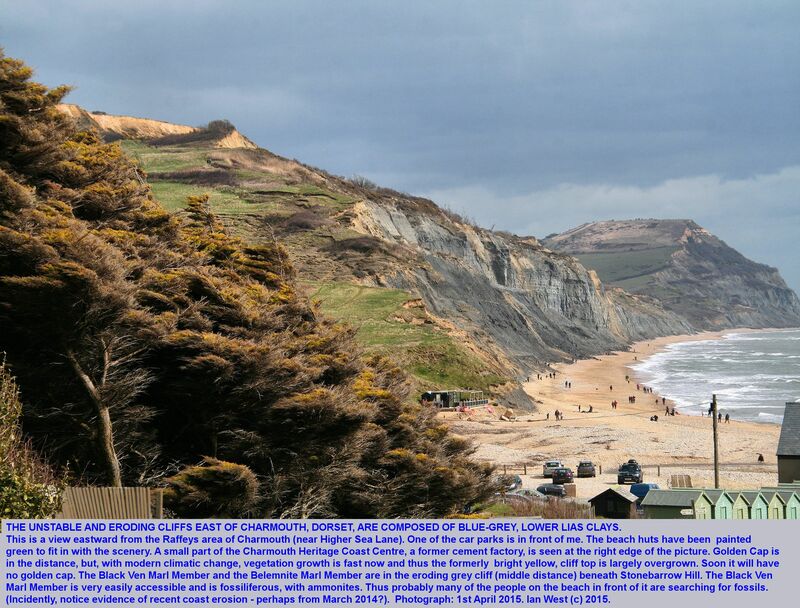 Two boys and their father were rescued by coastguards after they became trapped in a landslide. 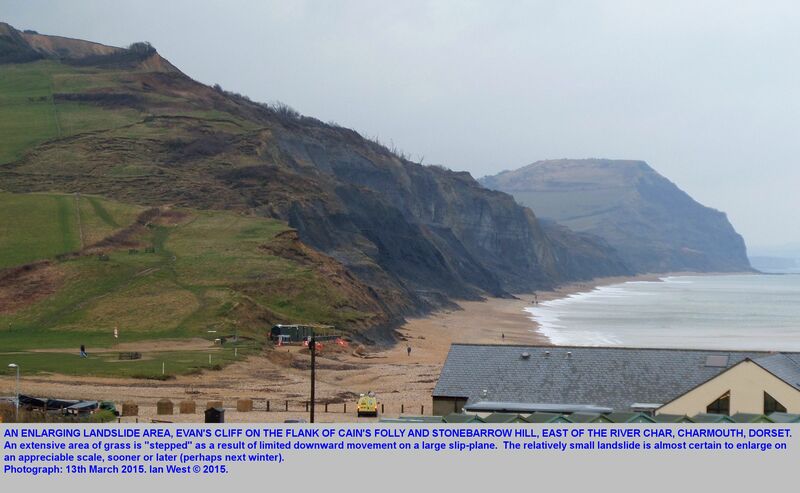 The children - aged eight and nine - were believed to be fossil hunting when 150 metres of cliff near Charmouth fell away. They became stuck waist-high in the mud and efforts by their father to save them resulted in him becoming trapped. Peter Pritchard, of Lyme Regis Coastguard, said: "We had to literally drag them out of the mud. We had specialist equipment available but did not need it." A further 13 people, including two hang gliders who had landed on the beach, were led to safety by coastguard at just after 3pm on Saturday. 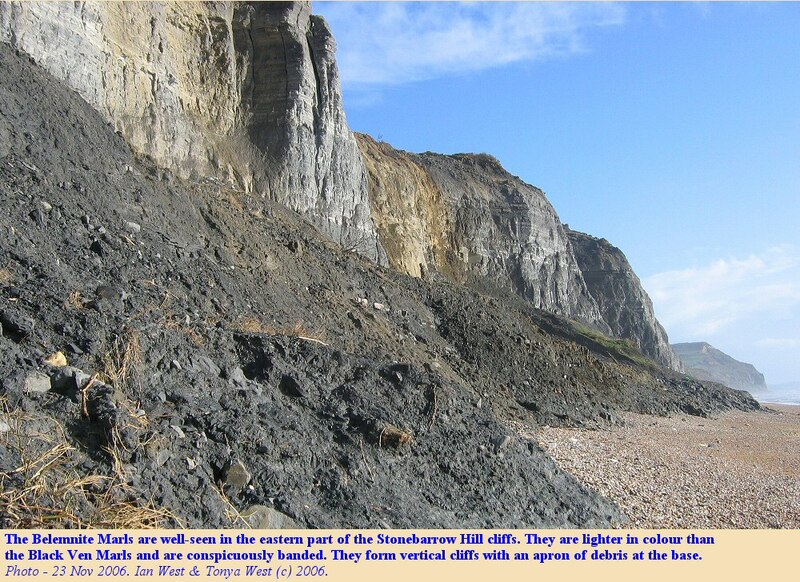 Mr Pritchard added: "The others were led around the landslide before high tide or they would have been trapped. Although landslides happen in this area frequently, this was a large one. It looks like a huge piece of a jigsaw has been taken away." West Dorset District Council closed the beach and put up signs warning the public to keep away. But despite the warning Sunday saw dozens of fossil hunters investigating the area hoping for new finds brought to the surface. A spokesman for Portland Coastguard said: "Obviously we would warn everyone to stay away from the area. It is still dangerous. The problem is that this probably won't stop the hardened fossil hunters. They know.how much a good fossil is worth." 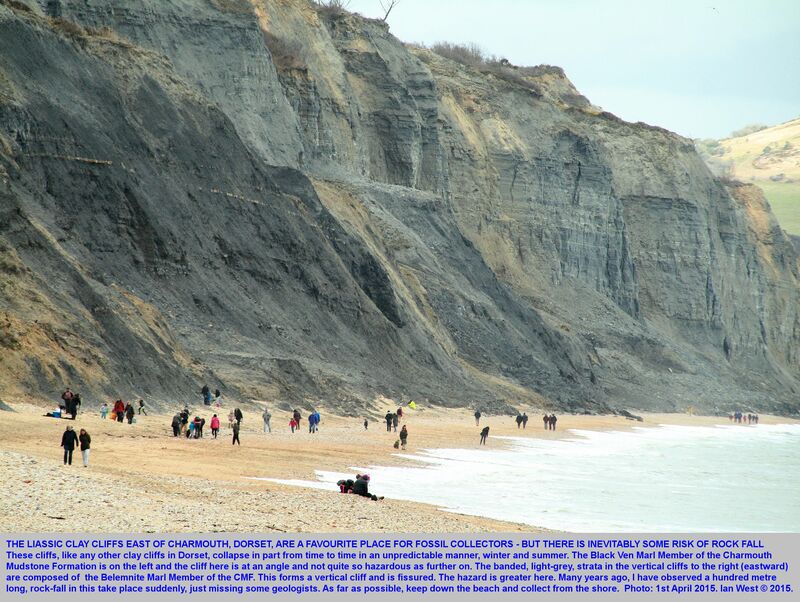 Dave Gregory, Coastguard watch manager, said': "We would warn everybody to take care whenever they are walking on cliff paths or beaches where there may be a possibility of cliff falls. We would also advise the public to heed warning signs and closure notices established by the local authority. Mr Gregory added that yet more of the cliff could slip away over the next week. He said the coastal path at Evans Cliff had disappeared and cracks have appeared in nearby fields." 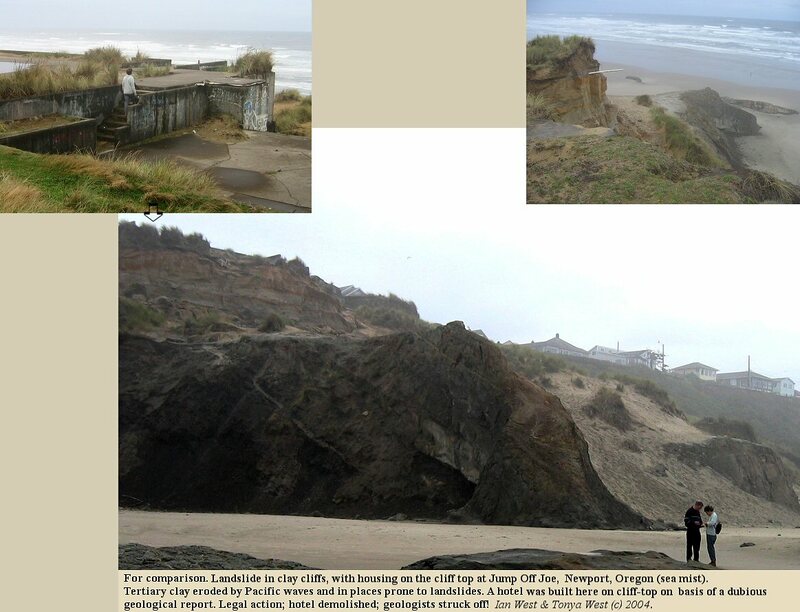 Shown here as an interesting comparison is the classic coast erosion location of Jump-Off Joe near Newport on the Oregon Coast. Fortunately there are no houses on the cliff top at Evan's Cliff and, as far as I know, no plans to build a hotel or condominium on the cliff edge! For more on Jump Off Joe - read Newport Exposition and Event Center--What Has the City of Newport Learned From Their Failure with the Jump-Off Joe Development?. There are many other reports on this (and you can find out who the unfortunate Joe was! - but now I am diverting too far.). 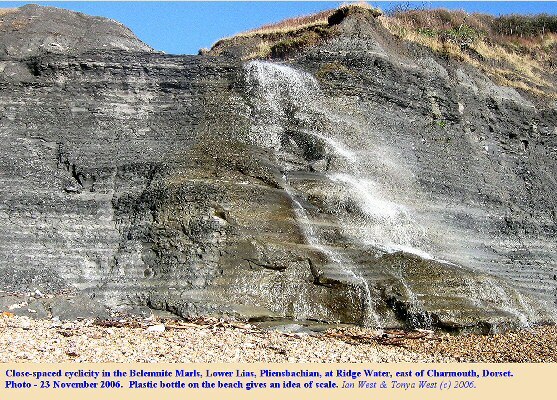 The Belemnite Marls are 23 metres thick and part of the Lower Lias and belong to the Uptonia jamesoni Zone, the lowest part of the Pliensbachian Stage. They are lighted in colour than the Black Ven Marls and are conspicuously banded; they form vertical cliffs in the eastern part of Stonebarrow Hill (with an apron of debris at the foot) and descend with a gentle dip to the waterfalls of Westhays Water and Ridge Water. With the Belemnite Stone (0.15m) they belong to the zones of Uptonia jamesoni below, and Tragophylloceras ibex above. 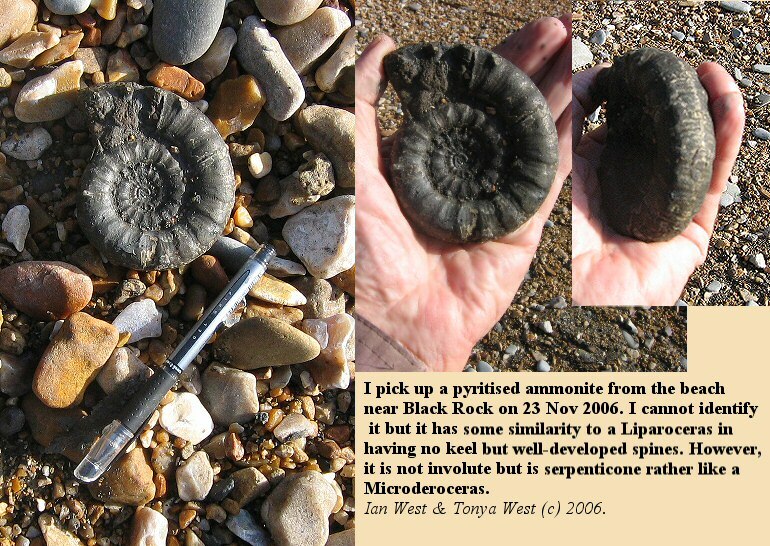 They are notable, of course, for an abundance of belemnites which were monographed by Lang (in Lang et al. 1928). 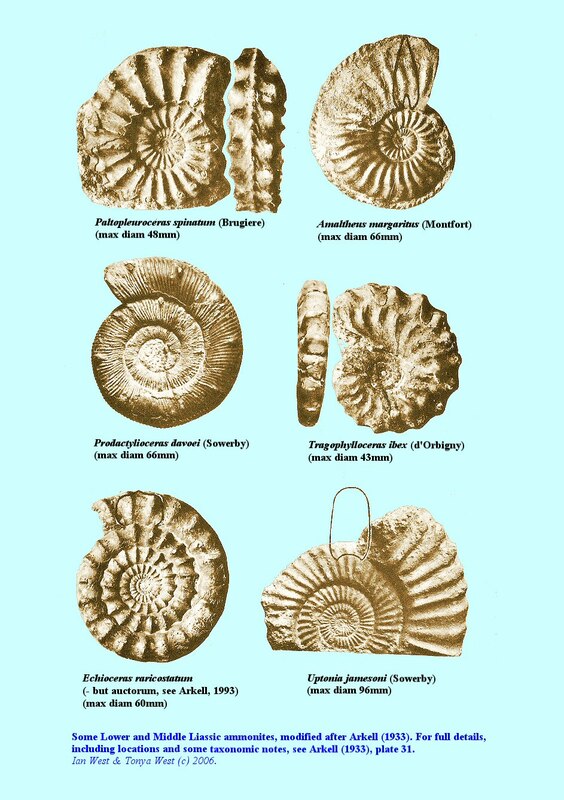 They also contain ammonites and including the pyritised, compressed and keeled Tropidoceras and also Aspidoceras, Platypleuroceras and Beaniceras House (1993). The sequences shown in the waterfall photographs above are from the upper part of the Belemnite Marls. The conspicuous three white bands in the Westhay Water section are from the brevispina Subzone of the jamesoni Zone. 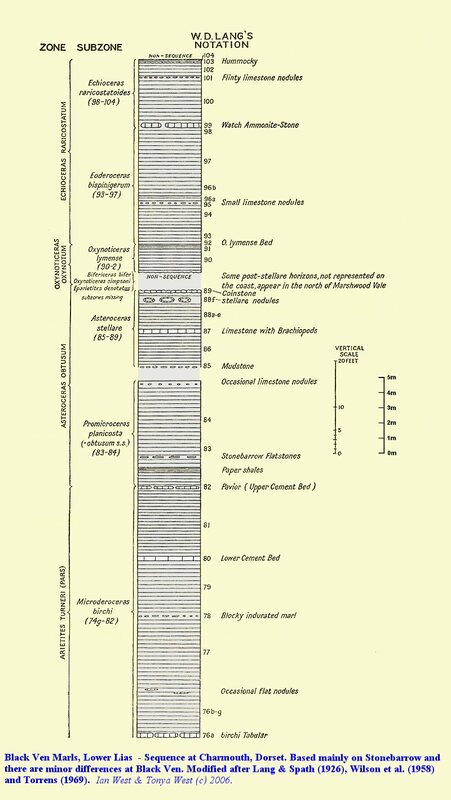 This can be seen by comparison with the excellent section of the Belemnite Marls given by Hesselbo and Jenkyns (1995, fig 11, p. 118, Measured Section of the Belemnite Marls, Charmouth to Seaton). 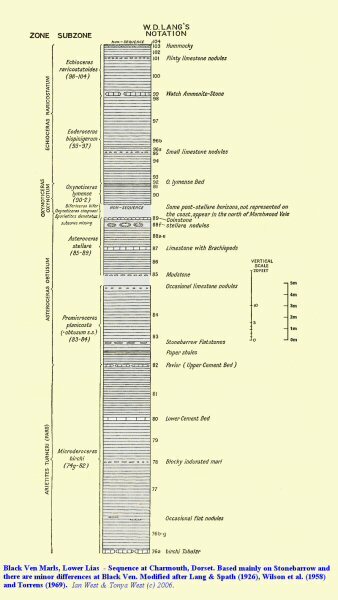 The Belemnite Marl with the very close-spaced cycles in mostly in the jamesoni Subzone of the jamesoni Zone. In terms of scale the total thickness of the three white bands is about 1 metre. 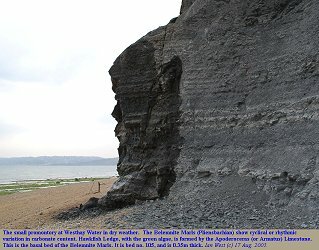 At the base of the Belemnite Marls is Apoderoceras or Armatus Limestone (Bed 105). This is a 0.35m limestone which crops out a reef visible at low tide at Westhay Water. Above that come the main sequence of marls with a cyclical variation in carbonate content (discussed further below). 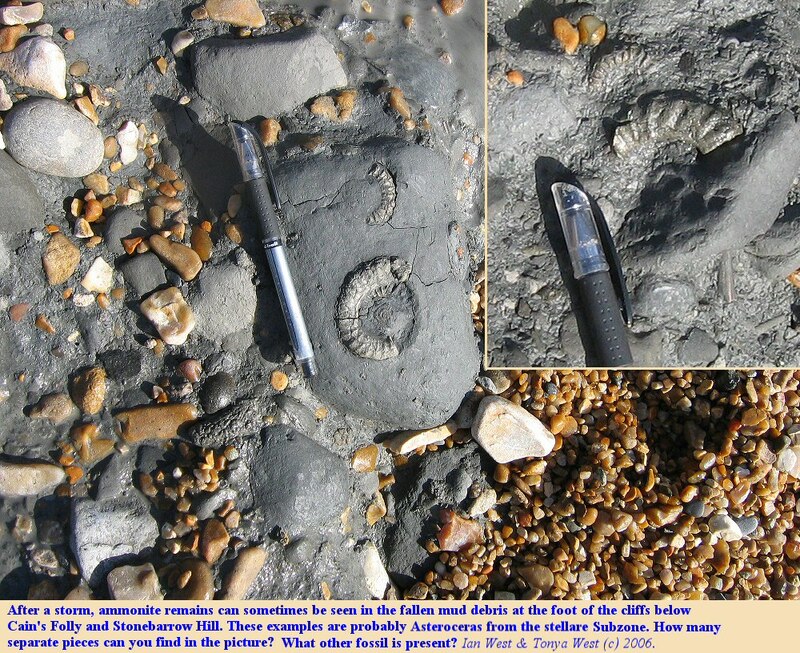 The top of the unit is taken as the Belemnite Stone (Bed 121, 0.15m) a laterally persistent limestone full of belemnites, ammonites, bivalves and with some rhynchonellids. The Belemnite Marls are of special interest to cyclostratigraphers because of this very obvious cyclical variations in carbonate content (which can be seen in the photographs above) and these have been considered to be the result of precession cycles of about 20 ka (thousand years). See Weedon et al. (1999) for more information on this, (and other papers by the same author). 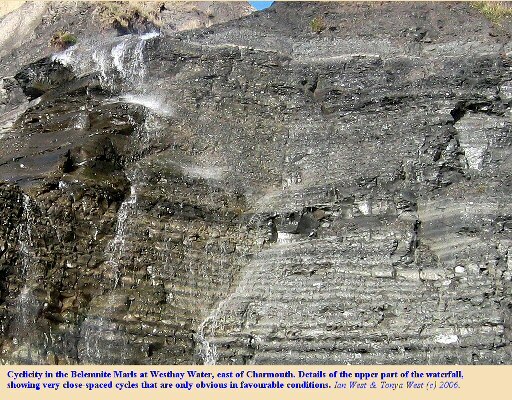 Notice that at the waterfalls of Westhay Water and Ridge Water (further east), some of the cycles in the higher part of the Belemnite Marls are very close-spaced and relatively inconspicuous. The waterfalls can be useful in showing details that would not be so easily seen in a dry and dusty cliff exposures. There is access to the Green Ammonite Beds in the St. Gabriel's Mouth area which is east of Stonebarrow Hill. For more information see the Golden Cap webpage. 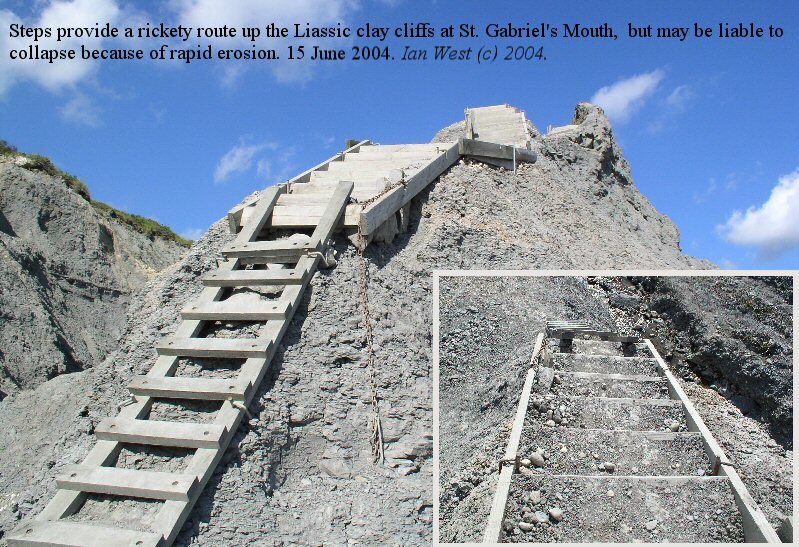 There are (or were) steps at St. Gabriel's Water. These are shown above, but they have been threatened by coast erosion, so their continued existence is not certain. They are not difficult for an able-bodied adult to climb, and provide an eastern route up from the beach beyond Stonebarrow Hill. It is quite a long way though from Charmouth sea-front, but there is a nice cliff-top (mostly) footpath back to Charmouth Village. Various field trips have taken place to this area. I much appreciate helpful discussion by members of this parties. This includes Staff and Students from London South Bank University. I particularly thank Richard Edmunds, Earth Science Manager of Jurassic Coast, UNESCO World Heritage Coast for kindly providing information on the landslide at Evans Cliff. Go to Bibliography and References on Geology of the Lyme Regis and Charmouth region.. Most papers referred to in this webpage are in this bibliography. Copyright © 2017 Ian West, Catherine West, Tonya Loades and Joanna Bentley. All rights reserved. This is a purely academic website and images and text may not be copied for publication or for use on other webpages or for any commercial activity. A reasonable number of images and some text may be used for non-commercial academic purposes, including field trip handouts, lectures, student projects, dissertations, exhibitions etc, providing source is acknowledged. at his private address at Romsey, Hampshire, kindly supported by the School of Ocean and Earth Science, Southampton, Southampton University and web-hosted by courtesy of the iSolutions of Southampton University. Field activities shown in this website are not necessarily those of Southampton University, some are of private visits, or of various organisations. The procedures and the safety aspects vary according to weather conditions, cliff state and whether the field trip is an organised one, a tourist trip, or merely a private visit.